The IFLA Global Vision Report answers questions like: What professional values do librarians share globally? What are libraries good at? What challenges them? What should they do more and what do less? What could the report’s findings mean in respect to the pervasiveness of open science? On 26 August 2018 the IFLA Global Vision Report was published. In total more than 30,000 people from 190 countries and from all kinds of library types contributed to the report’s content by sharing their opinions and concerns. More than 9,000 librarians took part in workshops and more than 21,000 voted online. IFLA had started its global vision process in 2017, aiming to explore the challenges and opportunities for the library field around the world. After publishing the Global Vision Report, IFLA now aims at making the vision a reality. For that purpose it started a global call for ideas on how to turn these opportunities into reality. Ideas can be submitted to an “ideas store”. 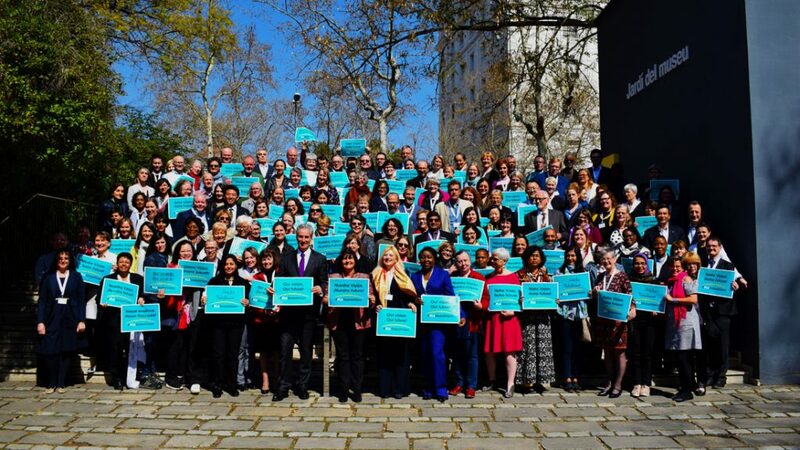 After analyzing and designing global vision actions until March 2019, IFLA plans to launch its new strategy in August 2019. We take a look at the report’s results that seem to be significant for the role of librarians in promoting open science. The report’s key finding is that across all regions, library types, and lengths of library experience, librarians share a deep commitment to the equal and free access to information and knowledge. No other value was rated as highly as this commitment on a global basis. The number two core value is commitment to dissemination of information and knowledge. The number one on the list of what libraries are exceptionally good at is providing opportunities for access to information and knowledge. It is the highest ranking across all generations and professional units of librarians and among all library types except school libraries and national libraries. It is also the number one for all regions except Africa and Asia and Oceania where it is the second and supporting learning, literacy and reading is number one. What should libraries do more of and less of? training and development of staff and leaders. Slightly different, the top five from academic and research libraries shares four items with the global top five: Instead of community engagement the results from academic and research libraries feature: Foster research and innovation. Furthermore, embrace digital innovation is the number one of the academic and research libraries list. Regionally viewed, among the top five from Europe embrace digital innovation is also in the top position. Europe’s top five list shares four items with the global top five. Instead of maintaining outdated services and collections it contains being shy and humble. The top five from academic and research libraries share four items with this list. Instead of managing change, results from academic and research libraries feature inadequate infrastructure. Ten opportunities for libraries based on the other results were also identified in the report. IFLA Global Vision: Top 10 Opportunities from IFLA on Vimeo. Libraries must be champions of intellectual freedom because equal and free access to information and knowledge depends on freedom of expression. Libraries have to update their traditional roles in the digital age to meet changing user expectations and to support learning, literacy and reading meaningfully. Libraries must keep up with ongoing technological changes to make sure all libraries have the right tools, infrastructure, funding, and skills to seize the opportunities of digital innovations. Libraries need to develop a spirit of collaboration by removing existing and perceived barriers to collaboration and realise the vision of a united library field. Libraries have to overcome their current structures and behaviours, like a passive mindset, and embrace innovation and change to tackle the challenges they are faced with. Libraries need to maximise access to the world’s documentary heritage by applying innovative practices and tools, sharing expertise and resources, and advocating for solutions. Agreeing on equal and free access to information and knowledge as their core value makes librarians natural evangelists of open access, open data and open science in general. Working less in isolation and more in collaboration is what libraries should do and what open science also is about. The ongoing technological changes, managing change and inadequate infrastructure are main challenges to libraries. They should also be less inflexible, bureaucratic and restrictive as well as less resisting and fearing change in order to tackle those challenges. Overcoming their current structures and behaviours, like a passive mindset, and updating their traditional roles in the digital age in conjunction with training and development of staff and leaders would enable them to embrace digital innovation and to foster research and innovation. This would also help to promote open science.